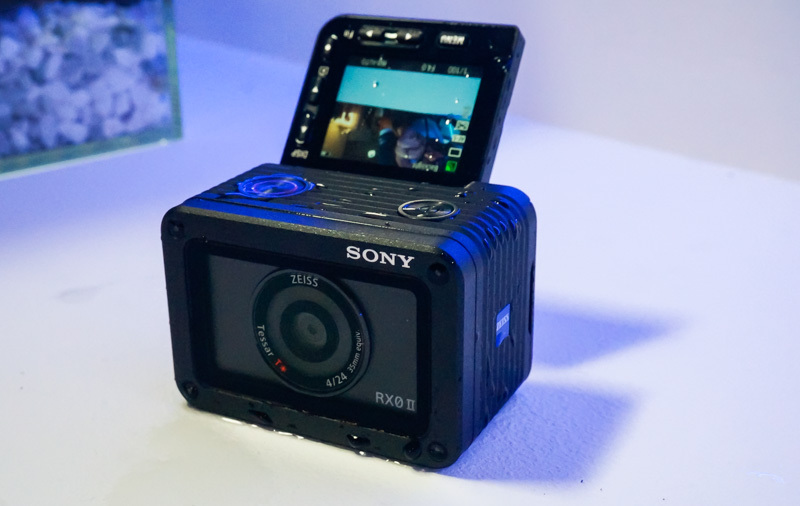 Meet the new Sony RX0 II. As you can see, it’s an incredibly small and light camera that now packs a tilt-able rear LCD screen so you can more easily use it for selfies. As with before, the camera is waterproof, dustproof, shockproof, and even crush-proof, which really makes the inclusion of a tilting rear LCD more impressive as it has to survive all of what we just mentioned. It measures just 59 x 40.5 x 35mm and weighs only 132g, so it's certainly easy to bring along with you. As we wrote in our earlier news report, the RX0 II has a Zeiss Tessar T* 24mm F4 wide-angle lens. 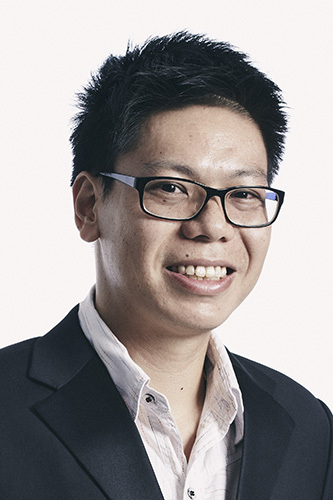 It uses a 1.0-inch stacked 15.3MP Exmor RS CMOS image sensor and an advanced BIONZ X image processing engine that offers better color reproduction compared to its predecessor. 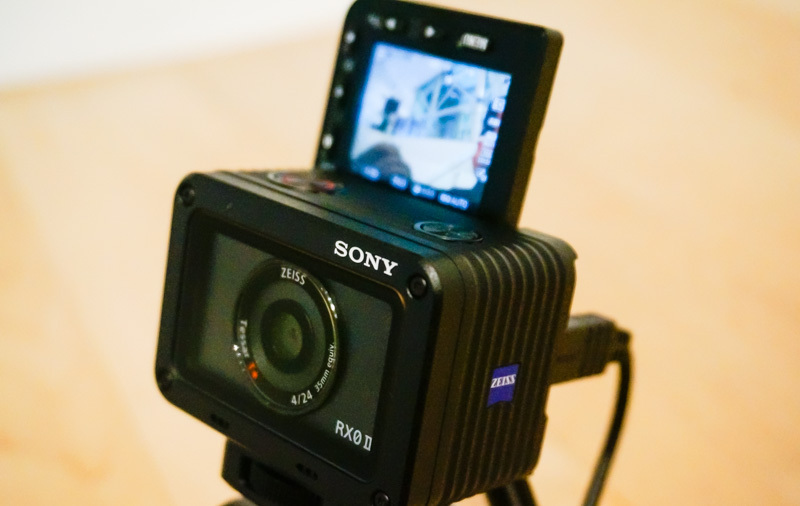 It does 4K internal recording, has an ISO range of 80-12,800, and the ability to capture at up to 16 frames per second. There’s also a new Soft Skin Effect function for basic skin smoothening that Sony says will help cover minor blemishes and wrinkles. Also largely improved are the Eye AF capabilities on the RX0 II, as the camera now picks out eyes with greater accuracy and speed than before. You can choose which eye to focus on or leave the selection to automatic. We found that this function worked well in good light, and face detect would also pick up multiple faces in the frame, which improves the camera's portrait shooting capabilties. 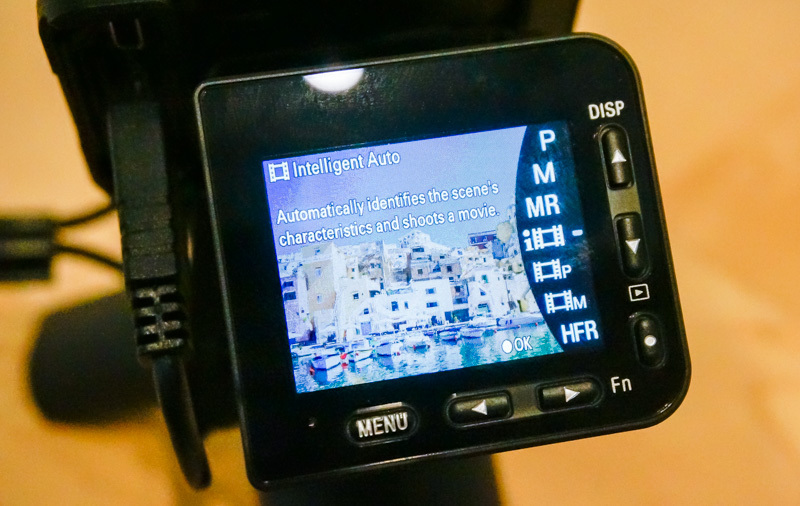 This is an important addition given how the small form factor of the RX0 II makes it difficult to manually select focus points. 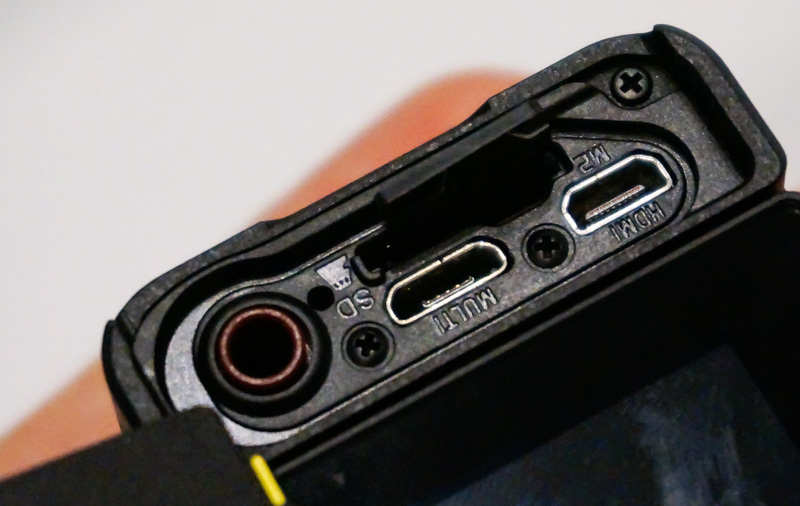 As you can see, the rear interface is largely unchanged from the first RX0, which means small buttons crammed against the side that serve dual functions. It’s good that the rear LCD is fairly bright, because you’d otherwise be straining to get to the various settings of the camera. On that note, something you will want to enable is SteadyShot. That's Sony's electronic image stabilization (EIS) option for steadier capture and it's said to be much improved for the RX0 II. 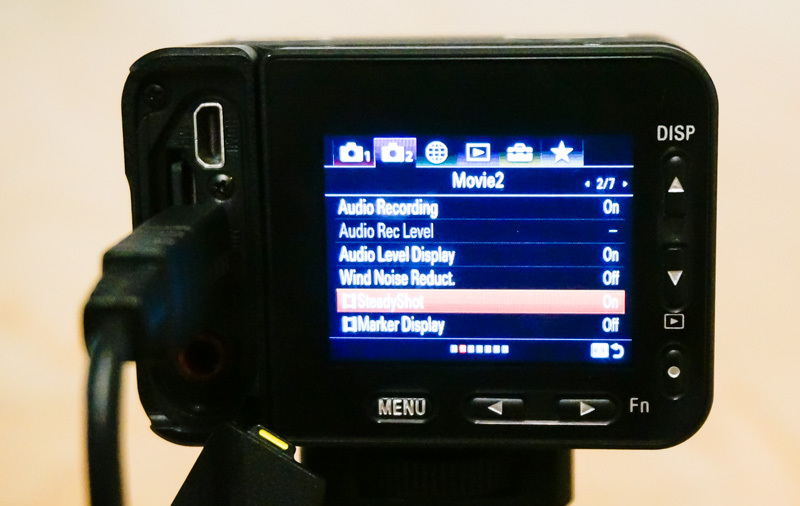 As you’ll see in the video above, this can be further improved by exporting the clip to a phone or tablet with Sony’s new “Movie Edit add-on” app. By cropping into some of the frame and intelligently following a subject, the app can adjust for a handshake in the frame, leaving you with a nicely stabilized video that you can output in multiple aspect ratios for your respective social media platforms. 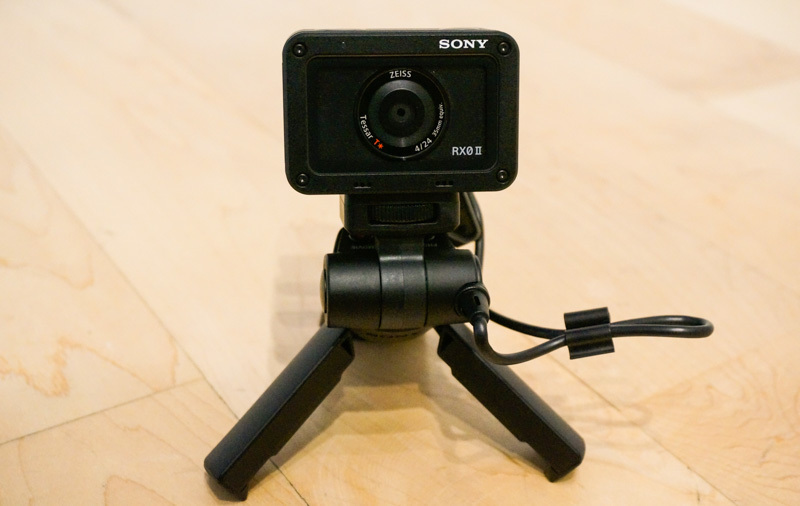 Also worth noting is the introduction of Sony’s Microphone jack and Shooting Grip (VCT-SGR1). Despite the awkward sounding name, this is grip really improves the usability of the RX0 II. 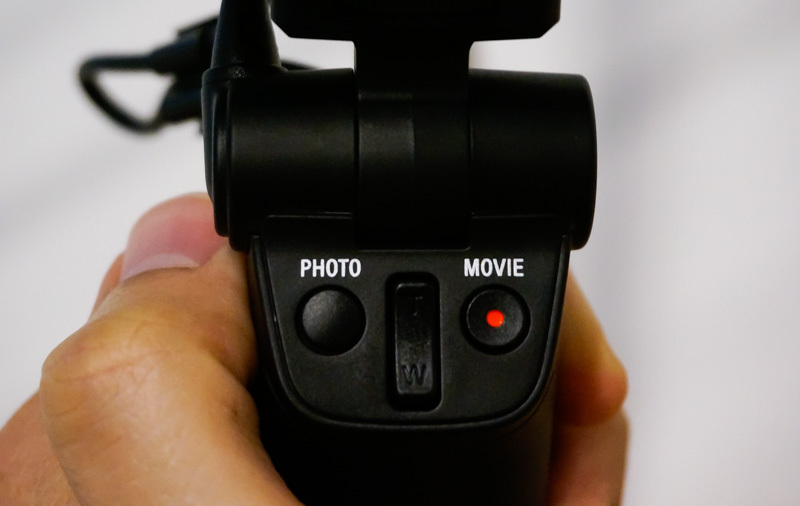 Adding this below not only gives you a comfortable grip, but also adds recording buttons and can be converted to a mini tripod so you can place the RX0 II on a tabletop and use it hands-free. As you can see, the camera includes a 3.5mm mic input jack so you can hook it up to a microphone for better quality audio recording. It also takes microSD cards for storage and comes with both micro-HDMI and a multi/micro-USB port. 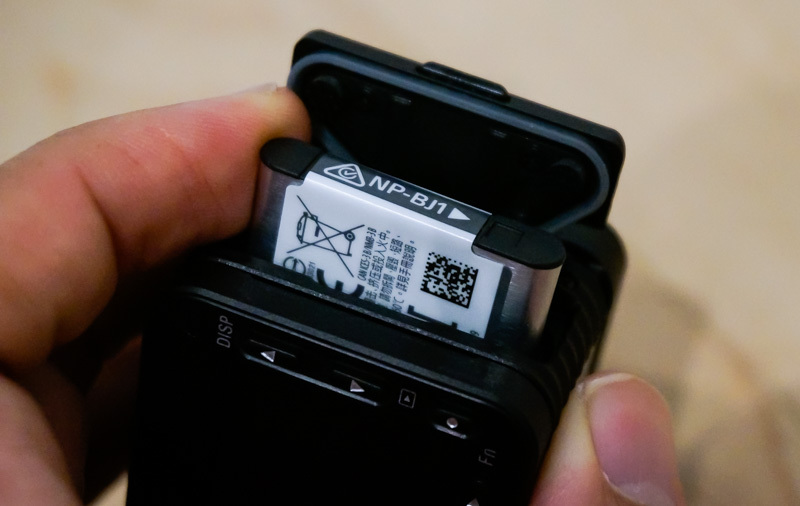 The NP-BJ1 gives about 240 shots or 120 minutes of recording time on a single charge. 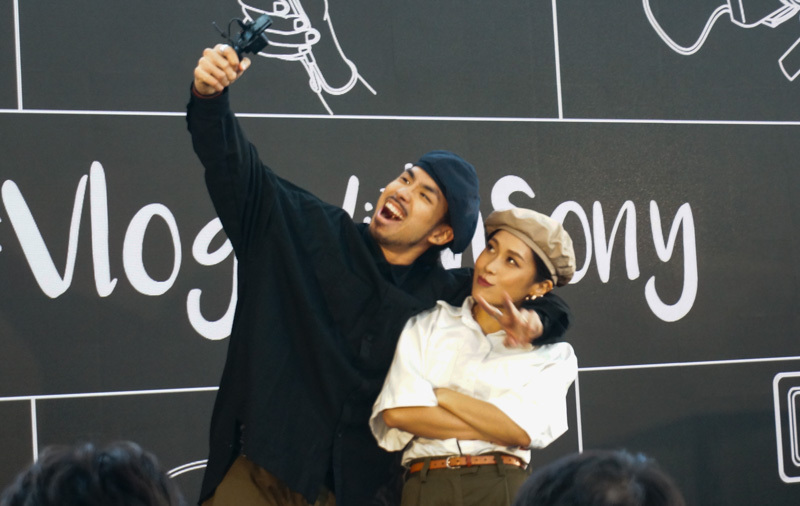 As with before, up to five RX0 II cameras can be controlled wireless via the Sony Imaging Edge Mobile app. The RX0 II will also be compatible with the Camera Control Box CCB-WD1, which allows up 100 cameras to be connected and controlled. The RX0 II will be available in selected Asia Pacific countries from April 2019 and we'll be updating the exact availability and pricing details as soon as we get word of them. To end off, here’s footage captured from the event (with Image Stabilization on but without the additional stabilization from the Movie Edit add-on app.) Rolling shutter effect seems to be apparent at some points, but the overall footage is fairly stable given we were just holding the camera by the shooting grip.